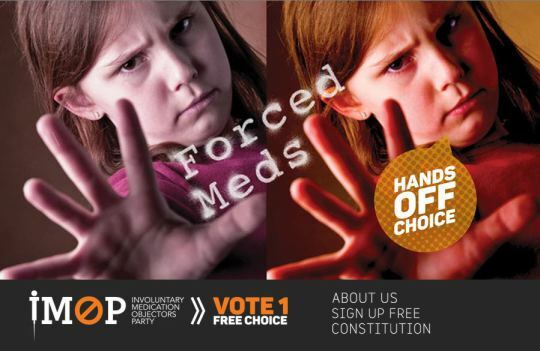 Hi, my name is Michael O’Neill and I am from the Involuntary Medication Objectors Party. 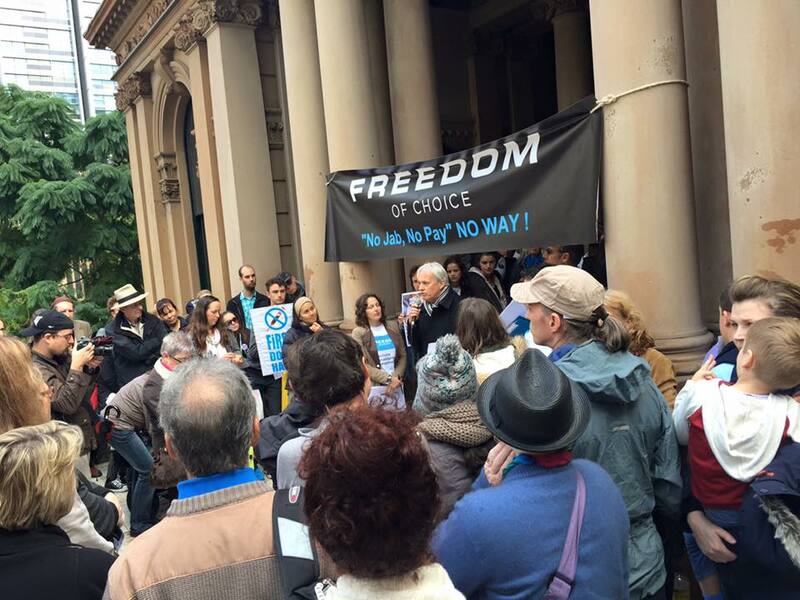 We are here to give a voice to the tens of thousands of Australians who have been ignored by the government and vilified by the press for their informed choice to reject the highly questionable government sponsored Vaccination Program. In April 2015 the Federal Government introduced a proposal to remove vaccination exemptions based on conscientious and religious grounds, as well as plans to cancel childcare rebates and family tax benefits for parents who refuse to vaccinate their children. 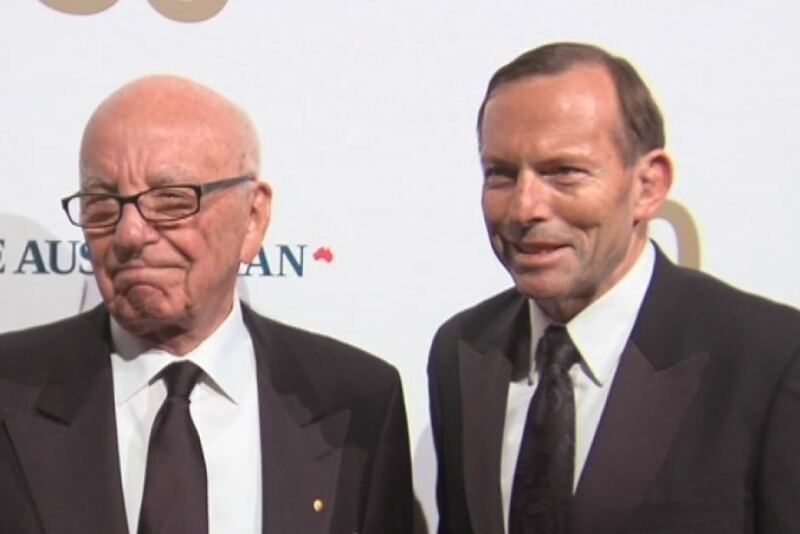 This is to begin January, 2016 and immediately garnered bipartisan support from both the Labor party and the Greens. Conscientious objecting parents believe the government is putting them in the impossible position of having to choose between feeding and housing their families and vaccinating their children against their will. This is not legal consent, it is unconstitutional and unethical. Currently we have Queensland moving to ban unvaccinated children from childcare. 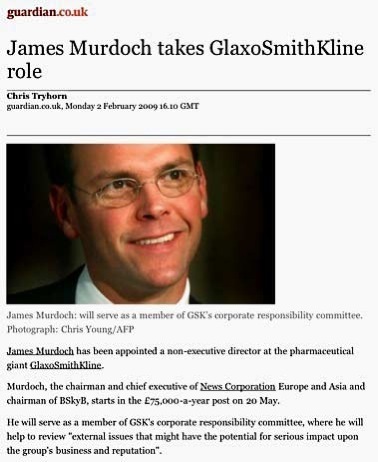 This is again using coercion as a method of ensuring pharmaceutical policy enforcement. 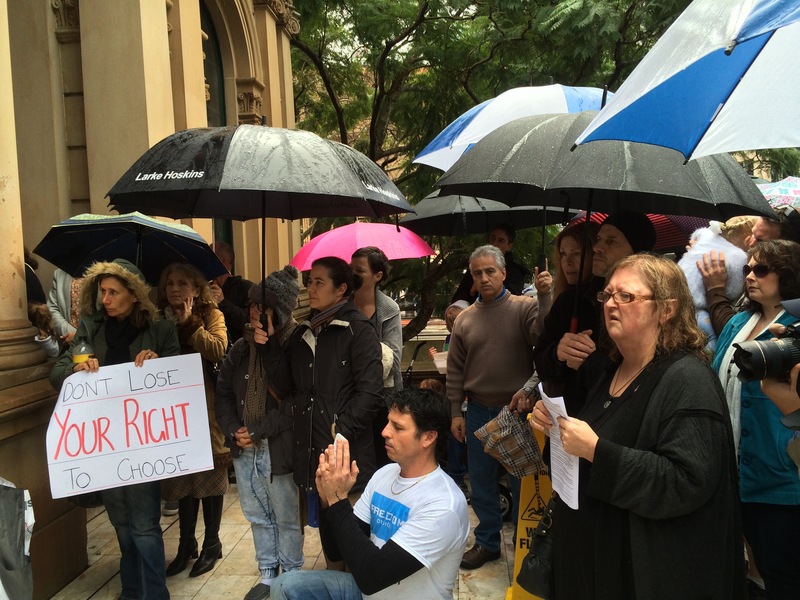 We need a voice for the rights of Australians to not have medication enforced upon them. We also raise questions and issues that remain silent in government and media discussions. A calm and open conversation is required. This is essential in any free and open society, as well as broader rights and freedoms of Australians within environmental sustainability. We also believe that Australians should not have fluoridation as an enforced policy, and we wish to highlight European countries that do not fluoridate based upon recommendations of people like Dr Arvid Carlson, Nobel laureate in medicine. We would you like you to sign up as a member so we can take these concerns to Canberra and provide a voice that is not being heard. It is free. 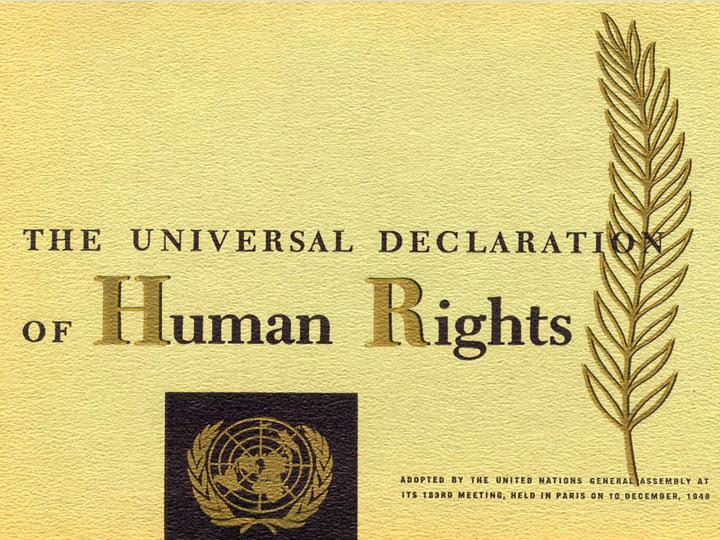 And it is essential that we maintain our rights over our bodies in order to remain free. 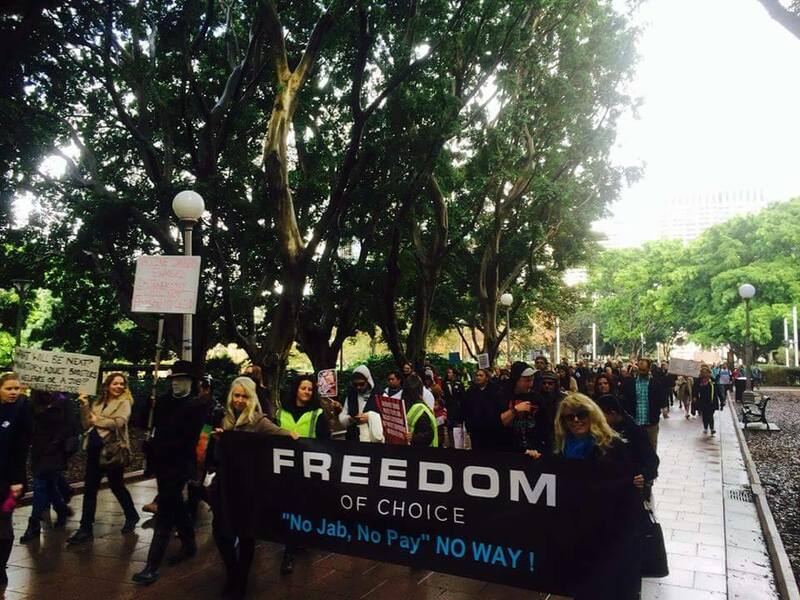 Sydney No Jab No Pay Protest Rally June 21st – What you didn’t see on mainstream media ! 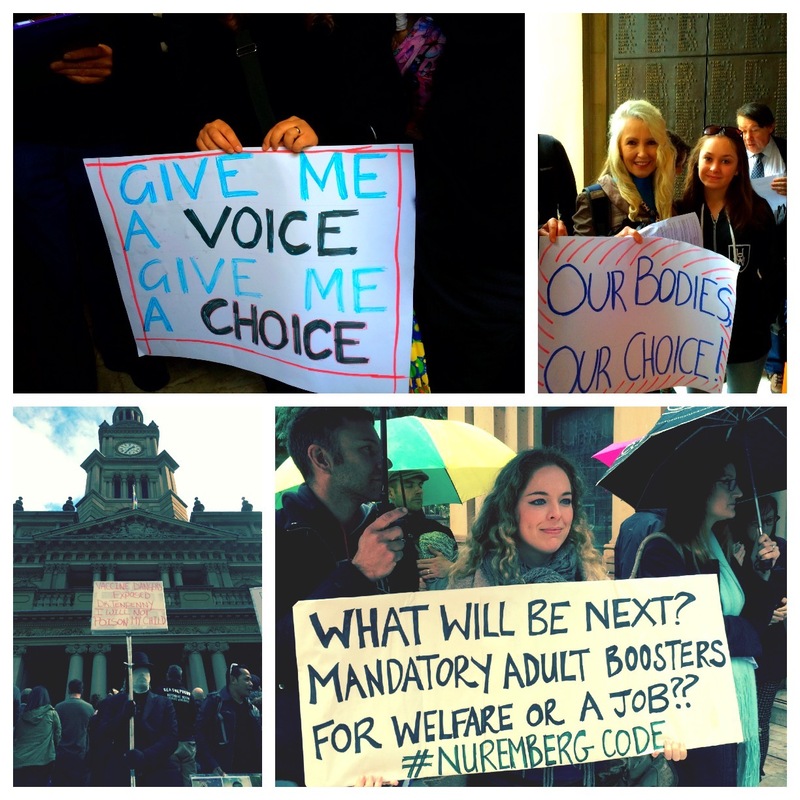 Nationwide Protests with an estimated 2000 people in attendance were held simultaneously in Sydney, Melbourne, Brisbane, Perth, Adelaide, Canberra, Tasmania on June 21, 2015 in opposition to the federal government’s new ‘No Jab, No Pay’ welfare reforms. In April 2015 the Federal Government introduced a proposal to remove vaccination exemptions based on conscientious and religious grounds, as well as plans to cancel childcare rebates and family tax benefits for parents who refuse to vaccinate their children to begin January, 2016 and immediately garnered bipartisan support from both the Labor party and the Greens. 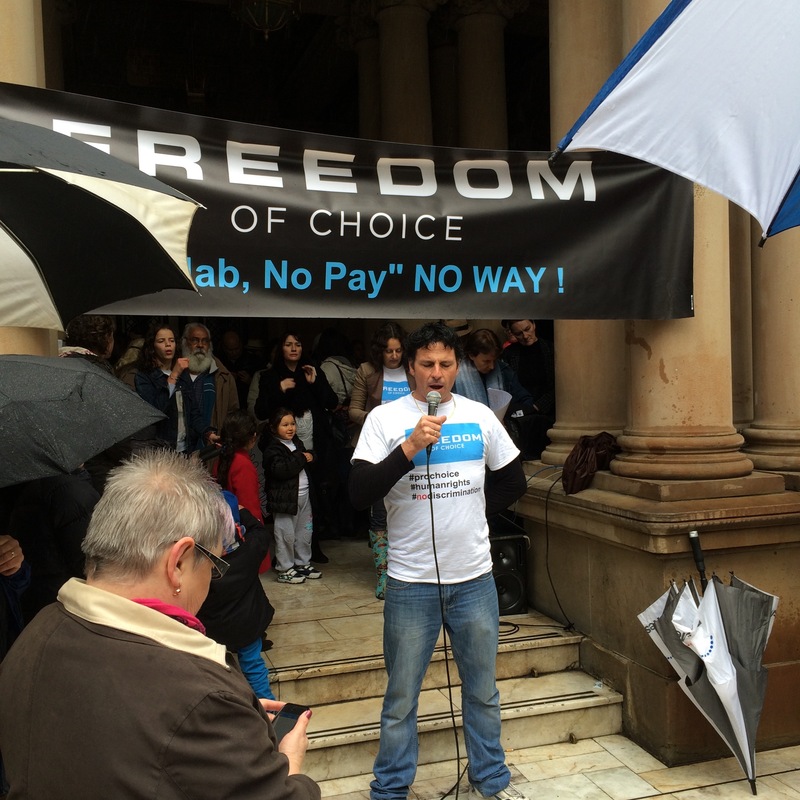 Many attended the Sydney protest on June 21st and chanted along George St “ Freedom of Choice Give me a voice. Give me a choice ” and banners included “ FREEDOM TO CHOOSE NATURAL TREATMENT” “FIRST DO NO HARM” and “ OUR BODIES OUR CHOICE” “ JABBOTT DOESN”T CALL THE SHOTS FOR MY KIDS “ and the protest concluded at the fountain in Hyde Park. 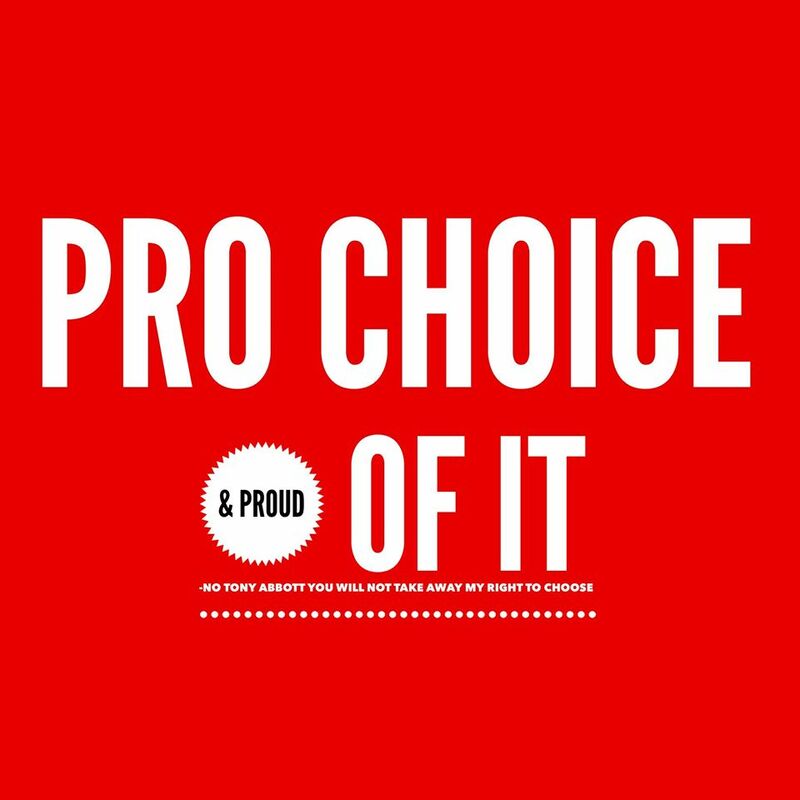 * Keep the conscientious objector’ clause in the legislation which accepts and respects individual rights for parents who choose to not vaccinate their children without penalty. 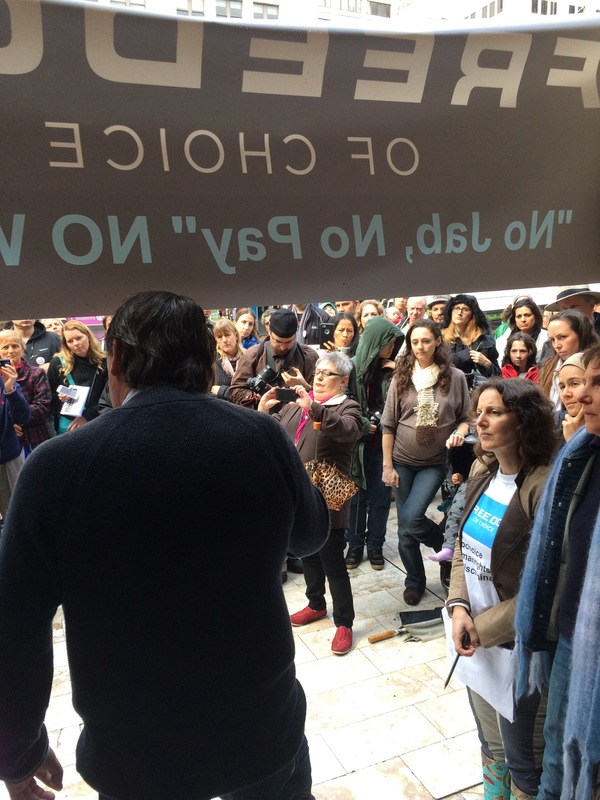 Protest Organisers have questioned Why the media have done everything in their power to promote the “No Jab No Pay” policy commencing January 2016, when the truth is this bill hasn’t even been introduced into parliament? And why has the same media not cover or attend the national protests against this policy. Considering the current schedule for vaccinations in Australia are 8 injections (74 antigen doses) before 12 months of age, and 2 more injections by 4 years of age. The ingredients of vaccinations as stated on the insert include multiple chemicals, heavy metal(s) & foreign organism components: such as aborted foetal & animal cell components and DNA, formaldehyde, aluminium, antibiotics, genetically engineered yeast, MSG, potentially animal viruses and/or other contaminants. The Government lists a significant proportion of reported adverse events as “certainly” or “probably” related, including neurological, inflammatory, blood, respiratory, cardiovascular, gastrointestinal, musculoskeletal, renal, endocrine & skin conditions. It also lists among serious effects: sepsis, toxic shock syndrome, anaphylaxis and death.32 Various ingredients, when injected, have been linked by medical researchers to such disorders as auto immunity , cancer , infertility & DNA modification. Some parents may wish to delay and many conscientious objectors parents who have witnessed their previously healthy children become damaged after vaccination will not concur. A single mother in attendance who didn’t wish to give her name said “This policy won’t make me want to vaccinate my kids but will put us into poverty. I won’t vaccinate my youngest child as I have in the past and had to see my older son suffer the consequences of an adverse reaction that left him with a permanent disability. I will always live a life of regret for the day I made a bad choice and no money will make me make another one“. 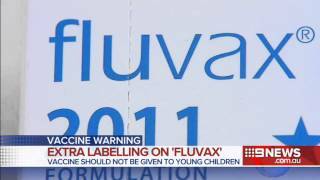 There have been numerous cases of children in Australia, who have been injured or killed after vaccinations, such as Saba Button Ashley Epapara, and the hundreds of children rushed to hospital during the Fluvax debacle of 2009. Parents being forced to vaccinate their children for government benefits have expressed concerns about their children being injured or killed . 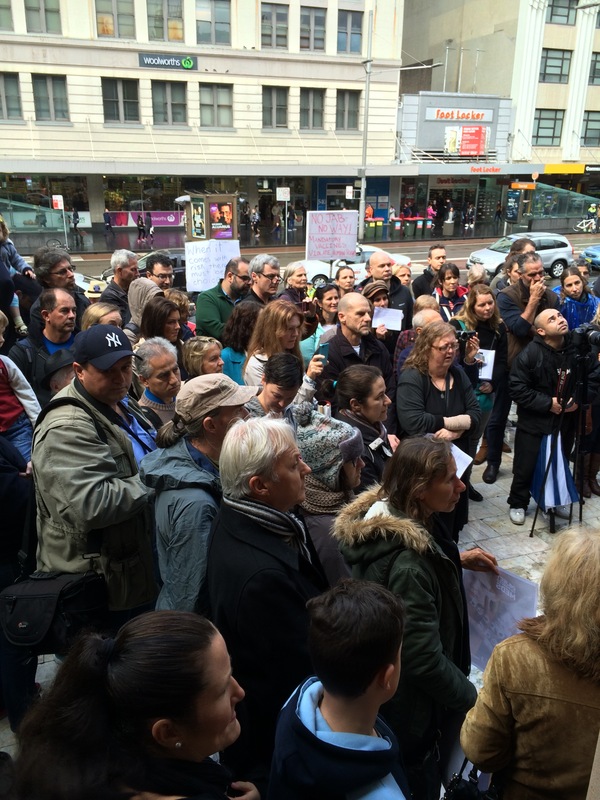 Protesters are asking whether the government is ready to be legally responsible for any such injuries or deaths, especially as there is no vaccine injury compensation scheme in Australia. The World Health Organisation states that injuries resulting from vaccination can be “severe” and require a lifetime of care, and that it is an “ethical necessity” that a compensation scheme be in place. 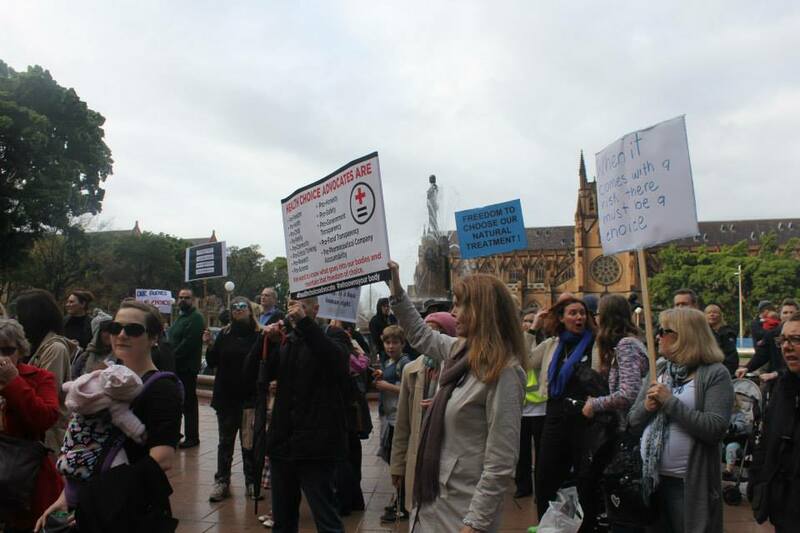 Australia currently has as no such scheme and protesters have questioned whether the government will provide for those who have suffered a vaccine injury. The USA has a “Vaccine Injury” trust fund that sits at 3.5 billion dollars. 1. 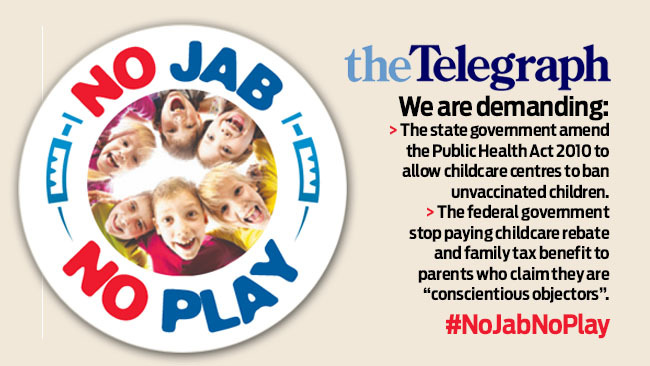 Visit “No jab, no pay, no play” rally on Facebook, and sign up to indicate that you wish to participate and receive updates. 2. Use the social media tools on the site to announce your participation in the protests. 3. Make calls and write emails and letters to your Member of Parliament.